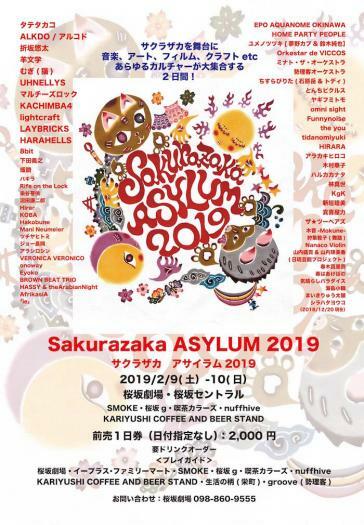 "Sakurazaka ASYLUM" is a music and art festival held once a year in the area known as"Sakurazaka" in Naha-city, Okinawa, Japan. Once This area was loved by so many people as Okinawa's first entertainment district. The situation of the town has changed due to partition arrangement and redevelopment, but people who are still fascinated by the once doubtful air that is drifting somewhere still keeps going. "Sakurazaka ASYLUM" will be held at the main venue of Sakurazaka Theater in the surrounding live houses, cafés and bars. We invite artists from various parts of Japan and Asia, as well as Okinawa, and introduce various expressions mainly on music. At the place "Sakurazaka ASYLUM", we aim to create a place where various cultures interact, newinspiration is born, creating a more developed relationship.